paragraphs on two different sides of the stone. 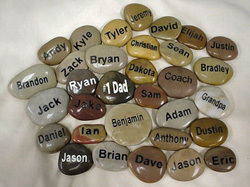 We may shock you with the amount of text that we can get upon the earthtone desert colored stones. Lists of stock words, phrases, & Boys and Girls Names are available on the website. birthday they attended when they receive the stone with the name of who the party was for. Polished River Stones, earth tones 2"-3" wide. Quantity discounts of 50+ pieces available. Call for easy ordering at 973-948-0085.